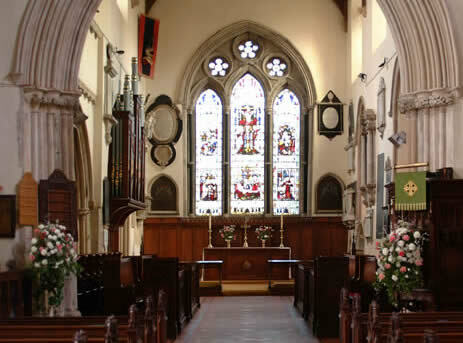 The stained glass of St Mary’s is referred to in the Pevsner Architectural Guide, Pembrokeshire (2004), describing the east window of 1893 as “a magnificent work by CE Kempe depicting the life of Christ in six scenes”. The Church being dedicated to Mary, the scenes are those in which Mary was prominent - Annunciation and Benedicite; Crucifiction and Deposition; Nativity and the Visit to the Temple. At the top can be seen the names “S Jacobus, Apostolos” and “Catarina, matyr”. Catherine and James were two of the christian names of Rev JHA Philipps (Vicar 1859 - 1875) and his wife by whose younger daughter, Lady Orpen, it was presented. It is said to be the high point against which to judge later work by the firm elsewhere in the Church and one of the finest examples of Kempe’s work in the county. 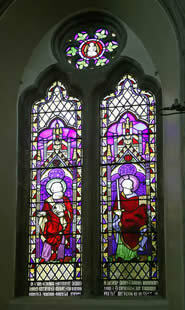 Other windows in the chancel are by John Bell of Bristol (1843) with two figures, Saints Paul and Luke against single colour bright backgrounds. Powell of Whitefriars, London (1955), and Kempe and Co (1929), where Kempe’s wheatsheaf motif is shown with a superimposed tower for WE Tower who ran the firm after Kempe died in 1907. Of the five memorial windows in the the nave, four are further examples of Kempe’s style in 1910, 1913, 1919 and 1920, and the fifth (1864) by William Wailes of Newcastle,1801 - 1881, one of the most prominent glassmakers of the mid-Victorian period. The west window by Kempe and Co in 1920 is the First World War Memorial showing six panels of saints and archangels; Gabriel and St Oswald (left); Michael and St George (centre); Raphael and St Edmund (right). In the north aisle is a single stained glass window dated 1965 by Celtic Studios of Swansea of St David and a boy. Described as a striking design probably by Howard Martin, the founder of the firm. The north porch contains four memorial windows by Kemp, 1920, small single lights of the four Evangelists.